Yarroway, Milfoil, Old Mans Pepper, Soldiers Woundwort, Knights Milfoil, Thousandweed, Nosebleed, Carpenters Weed, Bloodwort, Stauchweed, Saguinary, Devils Nettle, Bad Mans Plaything, plumajillo, Achillea sp. - For plant information, cultivation instructions and seed specs, see Cultivation below. Colorado - (Achillea millefolium) - A colorful mixture of pink, salmon,yellow, white, rose and apricot pastels. Lovely cut flower. Flowers the first year from seed. Height: 24in. Cerise Queen - (Achillea mileefolium)Apple red blooms with yellow centers lie in flat clusters. Foliage is grey-green and fern-like, forming a spreading clump 2-3ft. in diameter. Height: 24in. White Yarrow - (Achillea millefolium) - The most-used medicinal variety. Also serves as a good mosquito repellent. Fernlike leaves and brackets of white flowers. Height: 36-40in. Wooly Yarrow - Low growing variety with finely defined ferny foliage and brackets of tiny white flowers. Good ground cover. Height: 18in. Yellow Yarrow - (Achillea millefolium) Brackets of yellow flowers, foliage coarser than white yarrow. Full sun; plant height: 36-40in. Achillea varieties have a long history as medicinal herbs. Achillea millefolium was once widely used to treat wounds - to staunch bleeding and protect against infection. Legend has it that Achilles used yarrow to treat his soldiers. It has also been used to make a tea to dispel depression, as an herb of divination to promote second sight, and as a substitute for snuff (thus, Old Mans Pepper). 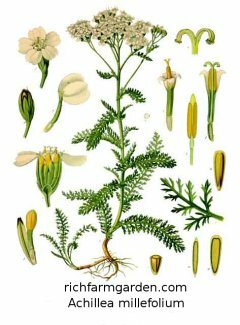 Yarrow was used in medieval times to flavor beer and to make liqueurs and bitters. Yarrow is also used to treat skin disorders. The plants are also used as fodder for animals and as a 'walk on' drought resistant plant for lawns, as a planting to prevent soil erosion and in wildflower plantings. Achillea is a valuable companion plant and repels many harmful insects, while attracting useful ones, such as ladybirds and hoverflies. The plant's essential oil contains proazulenes, which can be used to kill mosquito larvae. Achillea is a member of the Daisy family, Compositae, and is native to southern Europe, Asia and North America. There are many different subspecies of the genus. Plants have fern-like aromatic leaves and clusters of blooms borne at the ends of single, slightly hairy stems. Colors can range from white to deep red. The blooms are loved by bees and butterflies. Achillea is extremely vauable as a drought tolerant perennial ornamental as well. Achillea is widely adaptable and can thrive in nearly any ordinary garden soil and are easily propagated by sowing seed or by dividing existing plants. FOR TRANSPLANTS FROM SEED: Seeds are extremely small and should be handled with care. Sow seed in pots or trays. Press lightly into the soil or cover very lightly. Keep moist at 70F until seedlings reach 2 inches tall. Transplant to larger containers or outdoors when all danger of frost is past. Space plants 12-18 inches apart in rows 12-18 inches apart. DIRECT SOW: Prepare the soil finely. Sow seed lightly in rows 12-18 inches apart. Rake into the soil or cover very lightly. Keep moist until germination. Thin plants to 12-18 inches apart. FOR DIVISIONS: Dig existing clumps and separate into small pieces. Plant into new location. about 6 inches apart.